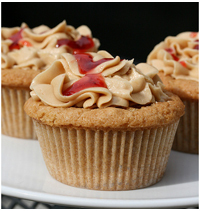 ...filled with peanut butter and jelly! 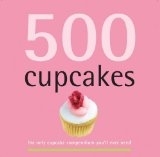 A filled cupcake recipe is nice to add to your recipe box because it's great for the kids. When they take their first bite, little do they know that there's a surprise waiting for them in the center of their cupcake! We hope you get a kick out of it too! Preheat oven to 350°F. Line twenty-four 2 1/2 inch muffin pan cups with fluted paper liners. In a large bowl, with your mixer set at low speed, mix flour, sugar, baking powder, baking soda and salt until combined. Add milk, peanut butter, shortening, vanilla, and eggs and beat until blended. Increase the speed to high and beat for another minute or two until creamy. Spoon batter into muffin pan cups, filling each cup about 1/3 full. Drop one teaspoon of jelly in the center of each cup and then top with the remaining batter. Bake for 22-25 minutes or until a toothpick inserted in the center of the cupcakes comes out clean. Immediately remove cupcakes from the pans and cool completely on wire rack. When the cupcakes are cool, frost with your favorite icing.